There will be over 100 booths to visit featuring community groups, arts and crafts vendors, and local businesses demonstrating and selling their products. Be sure to visit the Arts & Crafts area for beautiful gifts, home and yard decorating items, clothing, jewelry, holiday items and much more! The Annual Family Festival Parade steps off at 10:00 am and will march east along La Puente Road from Lemon Avenue to Suzanne Road. Parade highlights include the Wells Fargo Stage Coach, Walnut High School Marching Band, Walnut Sharks Swim Team, Walnut Valley Riders, LA Extreme Cheer, AYSO, community floats, and much more! There will be plenty for children to do as this year’s Festival will feature an assortment of carnival games, a mini-Ferris Wheel, Giant Slide, Wow Balls, a giant bounce house, a maze and other inflatables. The food court will feature many non-profit groups working hard to cook up some delicious food items while trying to earn money for their worthy causes. Stop in for breakfast, lunch and dinner. The Walnut / Diamond Bar Lions Club will be flipping flapjacks from 8 am to 10 am so you can get a great breakfast and support your local Lions Club. There will be a variety of lunch and dinner items from burritos to burgers to teriyaki chicken plus snacks galore. There’s plenty to see and do at this year’s Festival. Come out and join the fun, meet some new friends and catch up with the old ones. What started as a vegetable patch and some fruit trees in Rishi Kumar’s backyard is today a model of sustainable living that he calls The Growing Home. In fact, it is how the 25-year-old Diamond Bar resident makes his living. His home-based business teaches people how to “re-think, re-imagine and re-generate the suburban landscape” by example. Almost every square inch of his family’s hillside property in this tract community is used for growing food, which could potentially result in excessive water use. But Kumar has improved the quality and moisture retention properties of the otherwise hard, compact clay soil. Replenishing the soil with wood chip mulch and horse manure (acquired for free from local tree trimming companies and stables), terracing the slope (to slow water and sink it) and digging flat-bottom ditches — called swales — filled with boulders or tree branches (to capture runoff from the roof and sloping driveway) have transformed the area from lawn and patio to a lush and thriving urban farmland. Francine Rippy of Hacienda Heights figures she has won more than 1,000 ribbons at the Los Angeles County Fair. And this year is no different for the 75-year-old, who won 24 blue ribbons. “I’ve been doing this a long time, more than 60 years,” Rippy said. Of course, she has had decades of experience canning and preserving food. She learned as a teenager, growing up on a farm in Santa Fe Springs, now the Hathaway Museum. This early experience has served the Hacienda Heights woman well over the years. Her jellies, jams and preserves consistently win blue ribbons at the Los Angeles County Fair. She says she has won sweepstakes award 13 times. “She is dedicated to the craft of preserved foods and we are honored that she continues to share that talent and passion with everyone here at the Los Angeles County Fair,” said Shanell Fuquay, Community Relations Coordinator. Fuquay said the fair’s records don’t go back very far, but Rippy has won the sweepstakes for easily the past 5 years or more. That would have to be a record, Fuquay said. Today, Rippy receives fresh fruit from friends and neighbors. She keeps her canning utensils ready because you never know when berries will ripen. The avid canner just finished making some blackberry jam. Puente Hills Habitat will celebrate its 20th anniversary at the Hacienda Heights trail head on Saturday from 9 a.m. to 1 p.m. There will be fun crafts, face painting, displays and prizes. Winners of the photo and essay contests will be announced. “We want to thank Hacienda Heights, Rowland Heights and Whittier for their support over the past two decades,” said Executive Director Andrea Gullo. The agency manages 3,800 acres in the Puente Hills Preserve. The park runs from the intersection of the 605 and 60 Freeways east to Harbor Boulevard. Over the past two decades, the authority has purchased 1,888 acres of land for $30 million and manages land owned by Whittier and the Sanitation Districts of Los Angeles County. The money came from fees charged by the now closed Puente Hills Landfill. The 20th anniversary begins at 9 a.m. with an easy 1/2 mile family hike led by a naturalist. 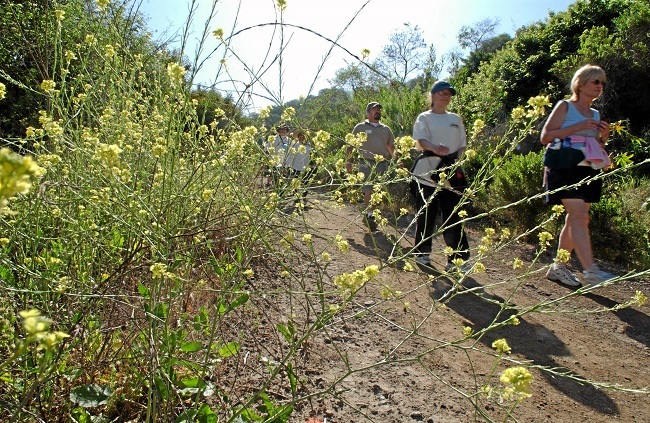 Others can take a two-mile hike to learn about native herbs. Habitat ecologist Lizette Longacre says hikers will explore the coastal sage scrub threatened with extinction in Southern California. 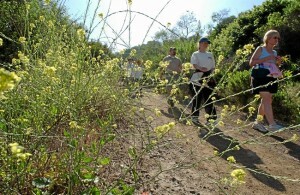 The rare plant can be found in Hellman Park and the Arroyo San Miguel, as well as Sycamore and Powder Canyons. Tall coast live oaks also grow on the park’s slopes and grasslands. The walnut and oak trees are important sources of food for the local wildlife. The big cats are drawn by many deer living in the preserve. “We have a healthy ecology here, with lots of rabbits and deer,” Longacre agreed. Bobcats, raccoons, skunks and coyotes roam the sprawling habitat..
Read more in Rich Irwin’s story HABITAT. Rose Hills Memorial Park & Mortuary will host a series of community planning meetings this fall in support of its 2015 Welcome Home Vietnam Veterans Day events. The Oct. 15, Nov. 5 and Dec. 3 meetings will start at 6:30 p.m. at Rose Hills Memorial Park in preparation for Rose Hills’ fifth annual Welcome Home Vietnam Veterans Day events, which are scheduled for March 22, 2015 and which will include a veterans resource fair, barbecue and a Homeless Veterans Memorial Service and Concert. Anyone who would like to provide input, suggestions or assistance is welcome to attend the planning meetings. The veterans event is open to the public at no cost. Rose Hills Memorial Park is located at 3888 Workman Mill Road in Whittier, Calif.
For more information, call Bonnie, 818.681.5777 or Phyllis, 805.341.7269, or emailcorridorcomms@corridorcomms.com. Rowland High’s 50th Anniversary takes place on Sept. 26. They opened their doors in 1964 and now they’re inviting all past, current, and future Rowland Raiders as well as our Rowland community to attend a fun-filled community jubilee. Special events will be held from 3:15 – 6:30, with a presentation before the 7 p.m. homecoming game. We will have free entertainment, game booths, photo booth, memory lane displays and tours of the new facilities. Get to meet and greet our former and current faculty & staff members including every principal in Rowland High’s history. Homecoming Football Game admission is $6 adults, $3 for Pre-High School kids. “Members of the American Postal Workers Union (APWU) will protest outside a Southern California postal plant scheduled for closure during a visit by the Postmaster General today. The Postmaster General has announced a plan to close 82 mail sorting plants, which will end to overnight delivery of First Class Mail and cause the loss of thousands of jobs in communities across the country. The City of Industry location is scheduled for closure on January 15. Under Postmaster General Patrick J. Donahoe’s plan, California will lose more postal sorting plants than any other state. California already has lost a dozen postal sorting facilities and USPS has announced five more closings scheduled for early 2015. The San Gabriel Valley plant employs 450 workers. The closure of the City of Industry sorting plant will slow mail to more than 70,000 area businesses in 31 cities. Among those whose mail will be delayed are the Jet Propulsion Laboratory and the City of Hope. The American Postal Workers Union represents 200,000 employees of the United States Postal Service. The union is affiliated with the AFL-CIO. Walnut High instrumental music director Buddy Clements thanks Cecilio Instruments for the electric string instrument donation on Sept. 16. 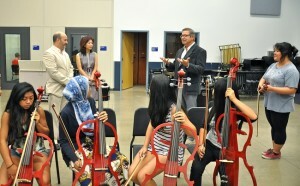 The Walnut High School Instrumental Music Program received a donation of ten electric string instruments on Sept. 16. Cecilio Musical Instruments presented the school with four cellos, five violins, and one bass valued at $10,000. A group of students eagerly watched, as bags of streamlined instruments were carefully unpacked in the orchestra room. The new strings seem futuristic with hollow-shaped frames equipped with an electric outpost for sound and option to be played silent with headphones. “We want to thank the wonderful people at Cecilio for making this incredible donation, said Instrumental Music Director Buddy Clements. The school already has big plans for the instruments. An electric string group will be added in front of the marching band’s Pirates of the Caribbean-themed field shows. The group will make their debut performance at a football game in about a month. “We’ve never seen anybody do this before, so we think it’s pretty innovative,” Clements said. The specialized strings will also be used with the jazz band and a new western-swing ensemble. Clements said the he kids have been really excited about the new strings. “They’ve been talking about it and dreaming about it. We couldn’t make it happen, but Cecilio made it happen for us,” he added. Senior violist Julie Banagale was the first to hold one of the new red mahogany finished electric cellos. “I’d like to play this!” she said. Two community members, Betty Tang, president of the World Youth Education and Jennifer Pak, WHS parent and president of the Diamond Youth Symphony Orchestra, stepped forward to coordinate the donation for the school music program. “We were inspired by the leadership of Principal Jeff Jordan and tireless efforts of directors Dr. Buddy Clements and Corey Wicks,” Tang said. This is the second year Cecilio has donated to Walnut High. Last year, they boosted the string program by adding 14 cellos, 10 violas, two basses, saxophones, trombones and more. “We’re glad to help out. When we learned there was going to be electric strings with the marching band on the field – it’s going to be great! I can’t wait to come by and see it,” said Cecilio spokesman Derek Zimmerman. Caffe Bene City of Industry will hold its grand opening on Saturday from 2 to 8 p.m. The store will open at 7 a.m., and the first 200 customers to spend $10 will get a free Caffe Bene mug! The afternoon event will feature a live DJ and a photo booth for customers to take pictures. Caffe Bene is located at 18508-A E Gale Ave., Industry.